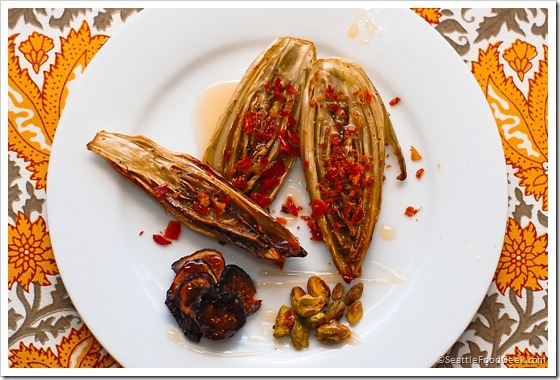 In no other dish does the condiment take center stage as it does in salad. With a billion varieties of dressings out there, it’s easy to be tempted by a bottle of Hidden Valley (or Annie’s, if you drive a Volkswagen). But, most of that bottled junk is full of calories and fat so it will have a long shelf life. This recipe is the base for most of the salad dressings I make. It takes all of 90 seconds, and it beats the pantaloons of anything I’ve had from a store. Combine all ingredients in a small bowl or cup and whisk with a fork until emulsified. Done! What makes this dressing really shine is starting with a great olive oil. 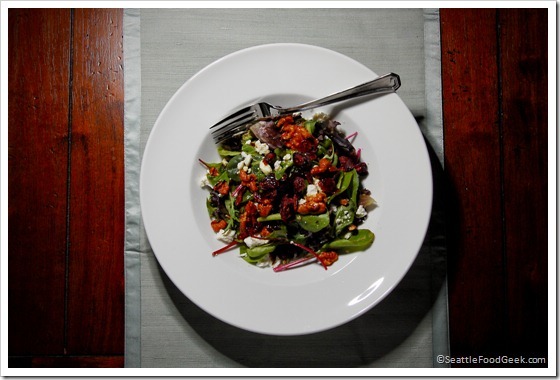 Oh, and if you’re curious about the salad in the picture, it’s field greens, goat’s cheese, candied walnuts and dried cranberries. The [red beet] pigments are contained in cell vacuoles. Beetroot cells are quite unstable and will ‘leak’ when cut, heated, or when in contact with air or sunlight. This is why red beetroots leave a purple stain. Leaving the skin on when cooking, however, will maintain the integrity of the cells and therefore minimise leakage. Create a double-layer aluminum foil pouch large enough to hold all the beets. Arrange the beets in the pouch and drizzle to coat with olive oil. Add a generous pinch of kosher salt and pepper, plus about 3 tbsp. of water. The water will create steam, helping the beets stay moist and also loosening the skins from the beet meat. Seal the foil pouch tightly and roast for about 90 minutes. Remove from the oven and open the pouch to vent the steam. Meanwhile, peel the onion and slice it into 1/4" thick discs. Separate each disc into rings (like when they make the onion volcano at Benihana. Come on, it’s pretty cool). Since I’m a little OCD, I only like to use the rings that are smaller in diameter than the largest beet. Which means the outer 4-5 rings are usually discarded. That’s up to you, though. Toss the onion rings (the ones you want to use) in a little olive oil, salt and pepper. 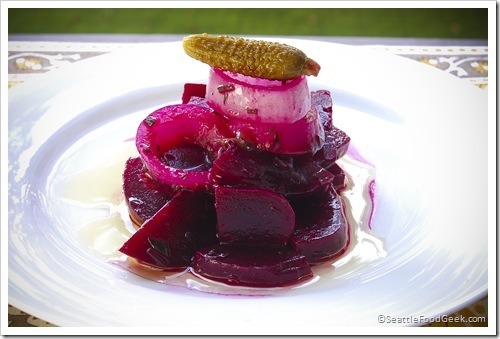 Place on a baking sheet and add to the bottom of your oven during the last 15 minutes of the beets roasting. This will soften and sweeten the onions just slightly, without taking away their great crunch. Once the beets are cool enough to handle, rub the outsides with a paper towel to remove the skins. Quarter the beets, then slice each quarter into 1/4" sections. 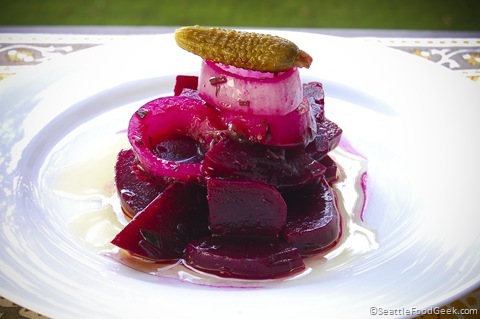 In a non-reactive dish, combine the beets, onions and cornichon. Toss with enough olive oil to just barely coat, then season with kosher salt and pepper. Add the vinegar and orange juice, and stir to mix. Cover with plastic wrap and refrigerate 30 minutes up to 24 hours. Just before serving, top with the chopped tarragon and garnish with another pinch of salt (sea salt is best). Although this dish (or some variation) has deep roots in traditional French cuisine, I must pay credit to Thomas Keller for inspiring this version. He doesn’t use cornichon, but I think he’s missing out.